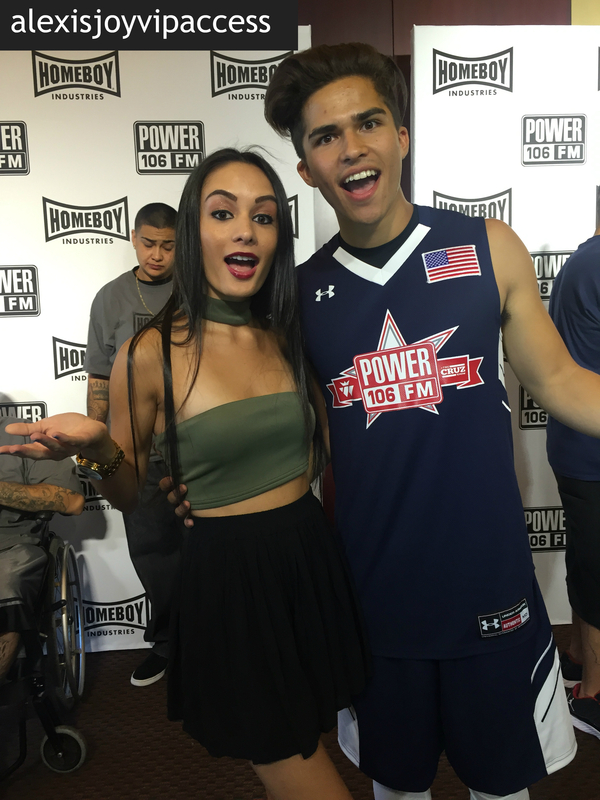 VIPAccessEXCLUSIVE: Singing Sensation Alex Aiono Interview With Alexisjoyvipaccess At The Power 106 All-star Celebrity Basketball Game! All it took was for everyone to hear his stupendous singing voice, and the rest is history. Before we all knew it, everyone, everywhere has been swooning over singing sensation Alex Aiono. If there is one person who defines what it is like to be so immensely talented that it is hard to even put it into words, then you basically have yourself none other than Mr. Alex Aiono. Ever since Alex Aiono has been releasing covers on his YouTube channel of some of the most popular, hit songs, we’ve all had an endless amount of heart-eye emojis for this incredibly talented musician. His singing voice is like no other and whether you are a fan of the song or not, Alex Aiono will make you want to listen to the song, and especially his cover of it, over and over again. In addition to all of his other exceptional covers, Alex Aiono brought out a “One Dance and Hasta El Amanecer” cover that currently has over 41,000,000 views and counting. Yes, you read that right, over 41,000,000 views. The cover instantly went viral with Aiono singing Drake’s chart-topping track and then putting a twist to the cover with Nicky Jam’s “Hasta El Amanecer.” Next thing you know, everyone was making reaction videos to Alex Aiono’s sensational cover and the phenomenal artist continued to grow his fan-base even more rapidly. Despite all of his massive success, one of the many things that sets Alex Aiono a part from other musicians is how grateful he is for all of his blessings. You can tell how genuine, decent and kind-hearted he is in addition to being one of the most talented musicians on this planet. Alex Aiono definitely deserves all of his successes – from performing all across the globe to starring in AwesomenessTV’s hit series, Royal Crush, amassing millions and millions of fans on his YouTube channel and social media networks, and even hosting for Radio Disney. There is only so much more coming for the outstanding Alex Aiono! I, Alexisjoyvipaccess had the greatest honor of covering the Power 106 All-star Celebrity Basketball Game benefitting Homeboy Industries and had a fantastic time interviewing Alex Aiono at the event. Alex Aiono dished exclusively to Alexisjoyvipaccess all about what his favorite cover is that he has brought out to all of his fans, what are some of his pre-show rituals, who is another musician he’d like to create a song with one day, and so much more only in our VIPAccessEXCLUSIVE interview. Alex Aiono even takes on a fun speed round and reveals something fans might not know about him and he shows us his best basketball player pose. Hear what the awesome Alex Aiono had to say in our VIPAccessEXCLUSIVE interview below. Thanks for the fun interview, Alex! Check out my VIPAccessEXCLUSIVE interview with the spectacular Alex Aiono at the Power 106 All-star Celebrity Basketball Game below! The Power 106 All-star Celebrity Basketball Game is one extraordinary event celebrating the love for basketball, the best in music and one terrific cause. Follow Power 106 on Twitter: @Power106LA and join in on the conversation by using #Power106! Previous VIPAccessEXCLUSIVE: The Incredible Skate Maloley Updated Interview With Alexisjoyvipaccess At The Power 106 All-star Celebrity Basketball Game! Next Article: Get Ready To “Rock Your Hot Mess” With Brooke Lewis And Alison Cohen’s New Clothing Line Available Now!